Neutron Therapeutics has developed an accelerator-based, in-hospital neutron source to replace the previously required nuclear reactor. This source is composed of a 2.6 MeV electrostatic proton accelerator and a rotating, solid lithium target for generating neutrons. Neutron Therapeutics will provide this neutron source as part of a comprehensive therapeutic treatment suite, that will combine all of the necessary components for BNCT treatment into a user-friendly package. The nuBeam suite* is a complete BNCT solution, including beam-shaping assembly, patient positioning systems and ancillary equipment. 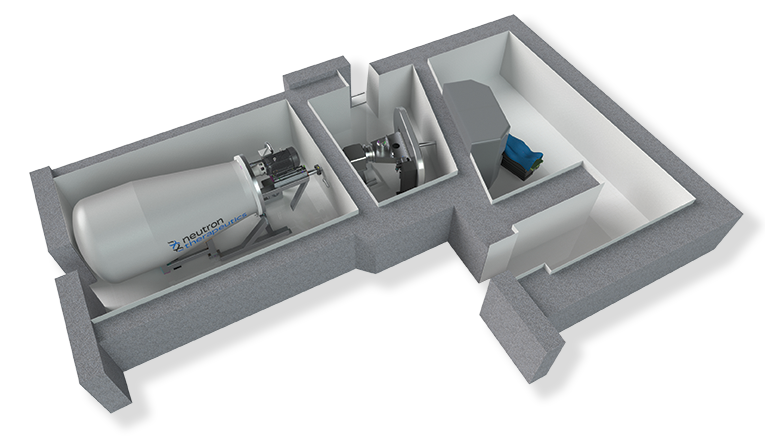 Neutron Therapeutics can also provide fully vetted shielding bunker solutions custom designed for neutron radiation.